New York: Stan Wawrinka survived searing heat and a spirited Ugo Humbert to reach the third round of the US Open on Wednesday as fellow former champion Andy Murray’s return ended in the second round. Wawrinka, unable to defend his 2016 Flushing Meadows title after undergoing two knee surgeries last year, said he wasn’t surprised at the challenge produced by 139th-ranked Humbert, a left-hander who is playing his first tour-level event this week after a dominant summer on the developmental Challenger circuit. “My level is there. I’m playing really good tennis,” he said. “I’m 33 years old, first time after big surgery that I’m pushing myself that much, but I think I did enough hard work to know and have confidence in my fitness. “I think there is a good chance that I’m playing better the next round,” added Wawrinka who faces Canadian Milos Raonic for a place in the last 16. Meanwhile Murray, the 2012 US Open winner, who was playing his first Grand Slam since Wimbledon of last year, is still fighting to find full fitness after hip surgery in January. The Scot’s limp was noticeable at times as he fell 7-5, 2-6, 6-4, 6-4 to Spain’s Fernando Verdasco, whose only win over Murray in 14 prior meetings was at the 2009 Australian Open. Murray, who had a chance to take the first set, also had enough in the tank to force five break points in the final game of the fourth. But he was unable to convert any of them before Verdasco closed out the win on Arthur Ashe Stadium on his third match point. “I think with Andy it’s always tough — not to close it just to play every point because he’s an unbelievable fighter,” Verdasco said. Verdasco booked a third-round meeting with another former champion, third-seeded Argentine Juan Martin del Potro who beat American Denis Kudla 6-3, 6-1, 7-6 (7/4). For the second straight day players faced soaring heat and humidity. The US Open’s extreme heat policy was in effect, allowing women a 10-minute heat break before a third set and men the same before a fourth set to give players a chance to cool down. The policy, a first for men in Grand Slam play, led to controversy as Murray complained that Verdasco conferred with members of his team during the break, a violation of the rules that organizers announced. “I’m not blaming Fernando and his team, they probably weren’t trying to break any rules,” Murray said, but he said organizers should have monitored the situation. World number one and defending champion Rafael Nadal was destined to miss the worst of the conditions, but he could look forward to a muggy night on Ashe against Canadian Vasek Pospisil. Raonic, who advanced 6-3, 6-4, 6-4 over France’s Gilles Simone, said it was probably one of the few times Nadal would be happy to find himself last on court for the second time in as many matches. “If the weather was normal, I’m sure he would want to play middle of the day,” Raonic said. 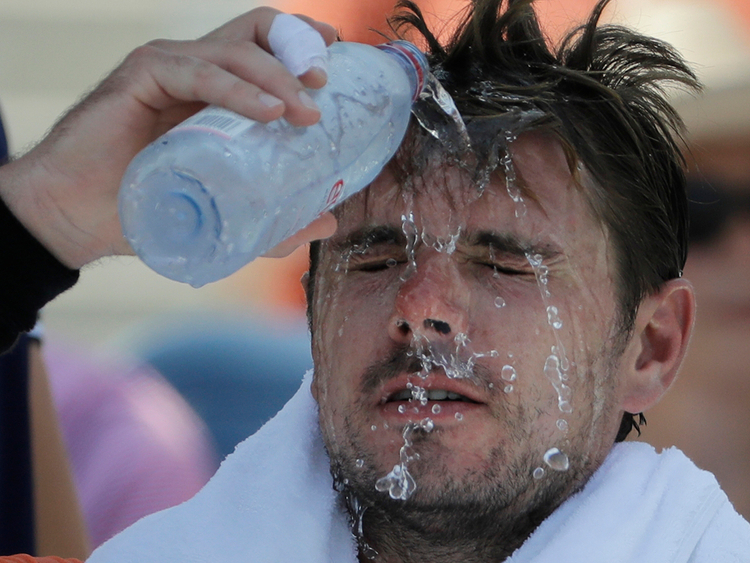 Greece’s Stefanos Tsitsipas said the heat took a mental as well as physical toll. It was a disappointing end to the tournament for the 20-year-old, who was the highest-seeded US Open debutant since Richard Gasquet played his first US Open as the No. 13 in 2005. Fifth-seeded South African Kevin Anderson, runner-up to Nadal last year, made quick work of France’s Jeremy Chardy, 6-2, 6-4, 6-4.